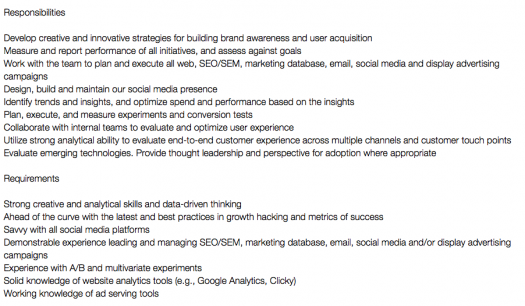 So what does a growth hacker do? So how is this different from marketing? What are the different types of growth titles and what do they mean? The recent boom in technology, startups and apps has given rise to a range of job titles and descriptions. 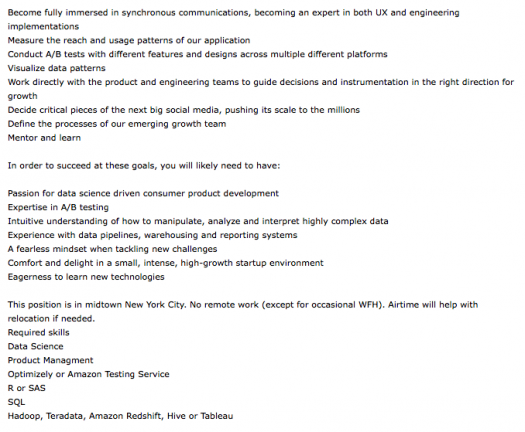 Companies these days seem to be looking for software ninjas, devOps gurus, or customer success professionals. Another much used but little understood term that is fast entering the career lexicon — growth hacking. Coined in 2010 by Sean Ellis, an entrepreneur and investor (who also coined the increasingly popular term “product / market fit”), the idea of growth hacking represents a marketing philosophy developed by technology startups that uses a wide variety of techniques and deep collaboration between product, marketing, sales and other teams to drive user growth. Growth hacking relies on alternative marketing methods such as search engine optimization (SEO), content marketing, A/B testing and social media marketing to drive low-cost, and rapid user acquisition. It wasn’t meant to be a title, and yet, as our jobs database attests, companies ranging from nimble startups to large technology firms are fast creating titles with the word growth in them — from growth hackers, to growth engineers, to entire teams dedicated to growth. There is a focus on creative tools and methods to drive growth including content marketing, SEO and others. Growth hacking drives product and UI / UX changes in a much more minute way than marketing typically does. This is critical for a technology startup trying to implement the features and experience that will create real growth and retention. Growth hacking tends to use non-traditional channels to drive growth through vitality and word-of-mouth, as opposed to formal marketing and advertising channels. But although growth hacking started in the startup world, it isn’t constrained there. As startups that pioneered growth hacking like AirBnb and Facebook have grown larger, they have formalized growth teams into their organizational fabric. Other tech and large corporations have followed suit recognizing the deep benefits of growth hacking. So in larger organizations, growth teams often sit between engineering and marketing constantly looking for ways to improve the product to drive growth, and looking for new non-traditional channels. Where marketing is often driven by campaign or branding goals, growth teams are left to focus on driving hyper growth for new products or features. This is best suited for professionals with a strong data and analytics background who are passionate about product and technology, and looking for challenges in business and strategy. These roles are often perfect for former engineers and developers who are looking to transition into business oriented role. Even at bigger companies, growth hackers and growth teams often get to cut through the silos and collaborate across the organization with the common mission of achieving growth. Therefore these can often be highly entrepreneurial roles at these larger firms, well suited to professionals adept at playing a cross-functional role. However, these tend to be mid-career roles once professionals have had a chance to pick up core technology and analytics skills. Increasingly, the word growth is showing up in a range of job titles in technology startups but also in more traditional companies. These sometimes mean different things. Growth engineers tend to be akin to growth hackers although they often involve more direct technological responsibilities and ask for deeper programming / technology skills. 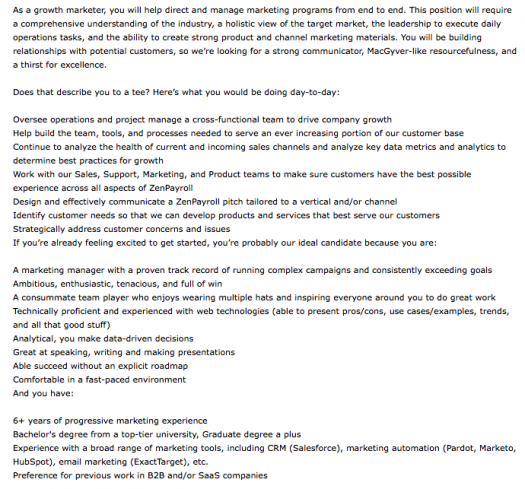 A typical growth engineer job profile is shown below. So are you ready to go for growth? Start with our curated collection of growth-oriented jobs at venture-backed startups.